Before entering or reviewing gifts, it's helpful to understand the various categories of gifts that can be tracked in Virtuous. All of these can be seen from the Giving tab in a Virtuous Contact record. Financial Gifts are the most basic category of gift in Virtuous, which includes the most common entries. From the Giving tab in a Contact record, you can click on the blue add button in the upper right of the Financial Gifts section to add a new gift, though this is not the most common method for entering new gifts. Gift entry is primarily done via the Gift and Contact Import, which is covered in a complete video training series. Gift Date: When did you receive the gift? Gift Amount: How much did you receive? When selecting a Gift Type, you may see additional fields appear. These are only relevant to specific gift types; for example, only check gifts will have a check number. When adding a Project designation to a new gift, it is possible to "split" a gift among two or more Projects. For this reason, you must specific a designation amount for each Project entered, even if the entire gift is being allocated to a single Project, and you must click the "ADD" button for each Project. This same rule applies to entering Premiums. Once you've entered all the relevant gift data, click "SAVE" to add the gift. One of the fields on the New Gift Form is "Passthrough Giver." A Passthrough Giver is an individual who should receive credit for a particular gift, even though the gift in question technically comes from another entity. Common examples might include business owners who give corporate gifts through their company instead of giving privately, or givers whose gifts come from a donor-advised fund. In these cases, while your nonprofit would receive checks from a company or community foundation, the intent to give actually originated with an individual. When viewing the Giving tab in a Contact record, you'll notice that there is no add button for Passthrough gifts. Passthroughs cannot be entered directly or by themselves; a Passthrough is an element of an actual gift. In some cases, you may want to split a single gift among multiple Passthrough Givers. For example, this is a common necessity for organizations who receive CFC gifts via the United Way. Since the Passthrough amount is always equal to the gift amount, for these situations, the best option is to split the gift into multiple gifts, entering a separate Passthrough for each gift. For many organizations, a critical part of major gift fundraising involves tracking solicitations. Gift Asks provide a way to do just that. As with Financial Gifts, click on the blue add button to bring up the New Gift Ask form and enter a new Ask. In addition to basic information, such as the ask amount and date, you'll have the option to enter an Expected Fulfillment Date, which is the date on which you expect to receive this gift, and enter any notes relevant to the Ask. Be sure to specify the correct Ask Type; you can either solicit recurring support, in which case you'll need to specify the frequency, or solicit a one-time gift, which would be a "Fixed Ask." You can type to search for Projects and for users in the Team Member field to track who made the Ask. Use the "Declined to Give" checkbox to track which solicitations are unsuccessful. When entering a Financial Gift, you will see a Gift Ask field. This is a drop-down list of open Asks for a giver, allowing you to connect a gift to an Ask and track the success of your solicitors. Planned Gifts, sometimes called estate gifts, typically mean that a giver has provided for your organization as part of their estate planning. To enter a new Planned Gift, click on more options in the upper-right of the Planned Gifts section and select "Add Planned Gift". On the New Planned Gift form, select the Planned Gift Type and enter in as much information as possible. In some cases, it may not be possible to complete all of the fields, but try to gather as much information as you can prior to entering a Planned Gift. If a giver informs you that they have made provisions for your organization in their estate planning, they are obviously committed to the success of your organization -- don't be afraid to ask them about some of the particulars of their Planned Gift. 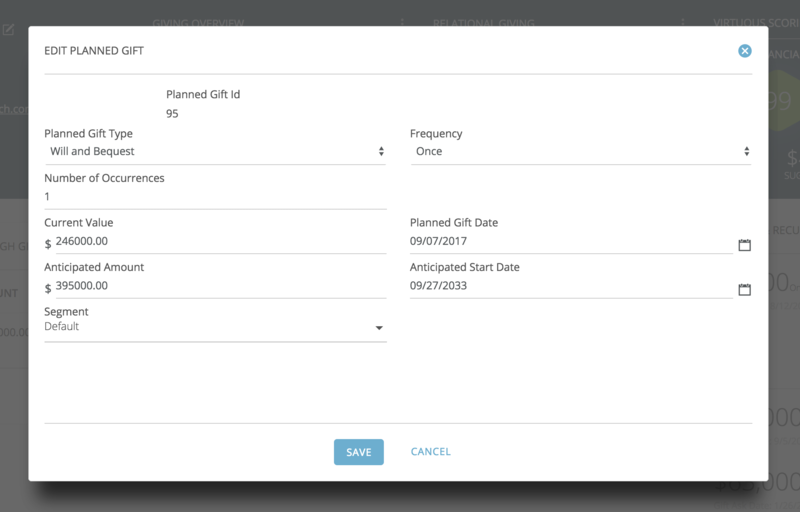 When entering a Financial Gift, you will see a Planned Gift field, which lists all Planned Gifts made by the selected giver. If the gift being entered is in fulfillment of a planned giving commitment, select the appropriate Planned Gift to associate the two in Virtuous.